I'm taking a break from Facebook. It started on November 8th and will continue until I'm ready to wade back in. It might be awhile. But I'm posting a lot on Instagram. This time of year I do a daily practice I call #ChristmasMagicWithHRC (fyi, HRC would be ME, Heather Rose-Chase, not a former presidential candidate or the Human Rights Campaign, as someone on Instagram just asked me). Every day I find a little something that is related to Christmas, post a photo, and write a little something about it. Some days it's hard to narrow it down to one thing, because in China Christmas decorations frequently stay up year round as they just look festive. My sons' local Chinese school lobby is completely decked out for Christmas, complete with Christmas tree, Santa heads, and huge garland at all times. My birthday is Christmas Eve, and if there was a Christmas Town, I'd be the mayor or the mascot or the most enthusiastic resident they've ever had. Buddy the Elf is my spirit animal. No joke. (Seriously, if you need some Christmas Magic, go check out my Instagram feed right now). For four years we lived across town, right next to a Pacific Coffee Company, a chain out of Hong Kong. I loved my little corner shop, they played a lot of Beatles and Christmas music year-round, and would always greet me with my order (Hello Caramel Chillino!). But for the first two Christmases we were there, their tree was tragic. It looked like someone had shot ornaments at it for target practice. The top was dramatically tilted because it had a broken trunk. Every time I'd go in, I'd make tiny adjustments to it just to make my heart a little happier. But the third year something snapped in me, and I walked in with wire, wire cutters, ribbon, and Christmas Magic. I calmly started removing the ornaments from the tree, wound some wire up the trunk to stabilize it, and then redecorated each branch. 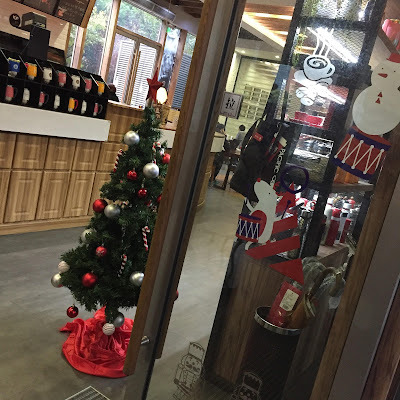 The store's employees watched wide-eyed in silence, whispering to each other, and then grinning widely at the crazy foreigner who fixed up their tree. Six months ago we moved across town and I have a new corner Pacific Coffee here. I'm not greeted by my order (yet) and I'm barely understood despite my best efforts. It makes me miss my old place. Today I walked in and waited in the crowded line and when it was my turn to order, the man at the register shouted at me "CARAMEL CHILLINO from Dongcheng Road!" Yes, yes, that's me, I hollered back, I don't live there anymore, I live here now! He started yelling in Mandarin at all the other employees behind the counter, who then looked at me and smiled and started talking loudly. I asked him what was going on, and he said, "I tell them you are the one who brought Christmas to Dongcheng Road and now to all the places!" He pointed out the tree behind me and asked if I liked it. And then he wouldn't let me pay for my coffee. I cried walking home, and I've got a big ol' lump in my throat now. This is our fifth Christmas in China. The Magic is spreading! Heather, I distinctly remember a gentleman that worked at the Dongcheng Rd. Pacific Coffee, I'm so curious if his name tag says "Jack Chen"!!! He was very courteous and would try hard to communicate with me to figure out what I was ordering. This post just makes me all kinds of happy. And you'll be happy to know that I used to be a "no Christmas music until after Thanksgiving" kind of girl, but you have changed my outlook. I am now a fan of the "Christmas all year long" club! Thank you! Great. Now I have a lump in my throat too. And the screen is all blurry. I think we should change your initials to HRCC: Heather Rose Caramel Chillino!